This Vanguard fund has $32.1 billion of total net assets. The annual dividend is 1.71%. It has 4-stars and Gold rating from Morningstar. The fund managers are Michael H. Buek, William Coleman, and Walter Nejman. The portfolio turnover rate is low, only 16%. This mutual fund is also known as fund of funds. You can buy this mutual fund with $3,000 initial funding. The benchmarks are Target Retirement 2025 Composite Index and Dow Jones U.S. Total Stock Market Index. The asset allocation as of November 2014 is Stocks (68.88%), Bonds (31.08%) and Short-term reserves (0.04%). The allocations to underlying funds are Vanguard Total Stock Market Index Fund Investor Shares (48.7%), Vanguard Total Bond Market II Index Fund Investor Shares (24.8%), Vanguard Total International Stock Index Fund Investor Shares (20.2%), and Vanguard Total International Bond Index Fund (6.3%). 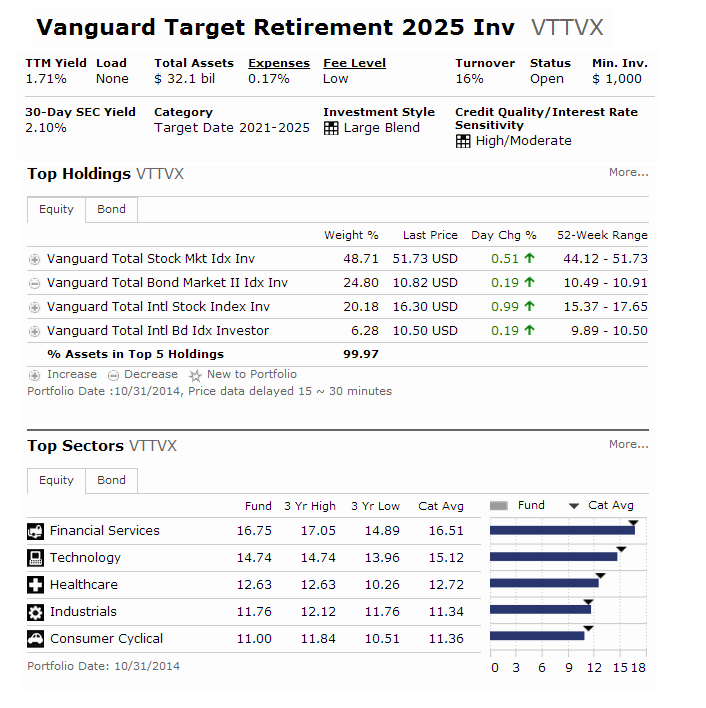 This Vanguard Target Retirement 2025 fund has low expense fee. It is great to use as a single fund in your retirement account. Performance has been great and consistent.